Animation in the cinema has become not only very lucrative but somewhat saturated, meaning that if you are producing a new cartoon feature, it has to be very special not only to stand out in the crowd but to stay in the memory for future families to enjoy. 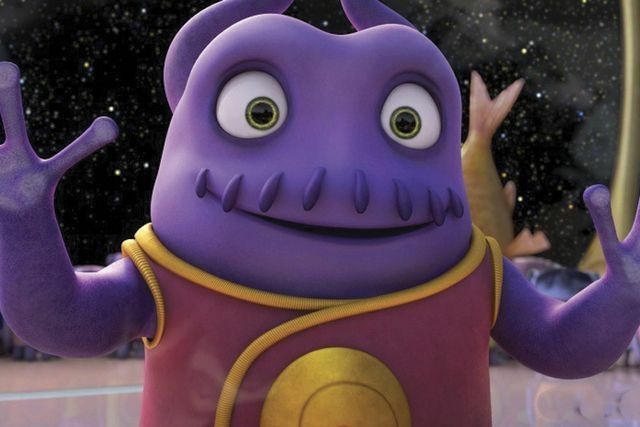 Home, the new film from Dreamworks Animation is a perfectly fine affair but lacks originality and enough invention to make you remember it minutes after leaving the cinema. Oh is part of an alien race called the Boov, whose main trait is to run away, especially from their enemy. Finding themselves on Earth, the Boov make Oh a fugitive after he makes a huge mistake. Alone and needing to get to Antarctica, he meets Gratuity ‘Tip’ Tucci, a young girl separated from her mother. The two make a pact: she will hep clear his name if he can help find her mother. So their adventure begins. The film starts with plenty of ingenious ideas and clever gags that you feel you are in safe hands. Then it takes the easy option of taking elements from much more superior films like Lilo And Stitch and ET, while delivering jokes that don’t always hit the mark and a huge amount of moralising, playing heavily on the importance of family and friends. Brightly coloured with nice soft edges and bubbles, this doesn’t take any real risks, draining any tension or excitement that could have helped propel the movie along. Instead the levels of perils are non-existent and so you wonder where this journey is going. Even when faced with the enemy, it becomes apparent that the animators don’t want the kids in the audience to be scared, so they soften the blow with cuteness. So we follow the relationship of this odd couple, the alien and the child, as they travel to different countries, listening them explaining why friendship is important or why family is important and how they are not so different after all, you feel like you are being lectured, which dulls the sense of fun. Add to that a soundtrack riddled by songs from Tip’s voice, Rihanna, which doesn’t enhance the action. The voice talent is made up of Rihanna and J-Lo, who are fine but don’t blow you out of the water. The fun comes from Big Bang Theory star, Jim Parsons as Oh. With his parrot-fashion English and lacking in understanding, it’s full of energy and comic invention. As is Steve Martin as the leader of the Boovs. It’s a pleasure to hear the former Wild and Crazy guy letting himself go again. It would be great to hear him doing more animations, where if he was given a larger role, could remind us all what a terrific comic actor he was. 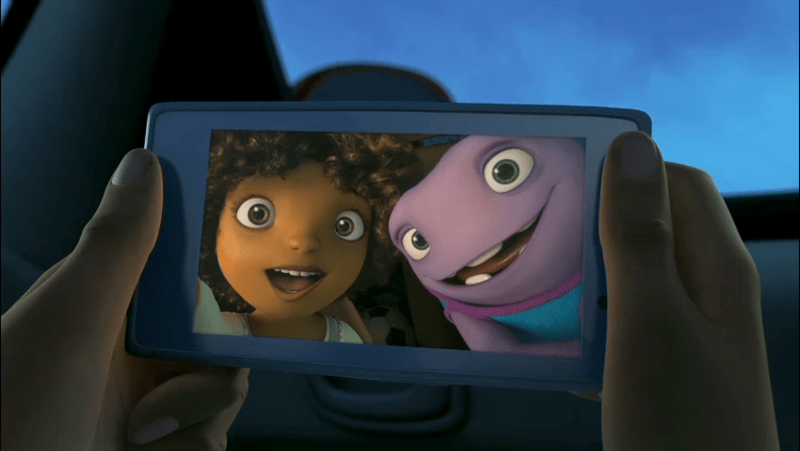 Home is a perfectly harmless slice of fun for a younger audience but it might test the patience of the adults they drag along. The occasional, more mature joke is hidden among some lame, infantile gags and characters that look like cheap rate Minions. If you want a human/alien animation, then stick with Lilo and Stitch. This just isn’t good enough.